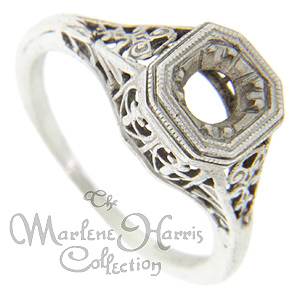 Filigree designs decorate this 14K white gold antique style engagement ring mounting. 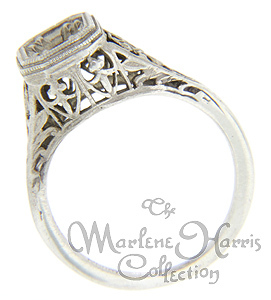 The ring measures 8.3mm in width and can hold a round stone 5mm in diameter. Made from the original master mold, the mounting can be ordered in 14K or 18K white and yellow gold. Actual prices depend on the current market value of the precious metal used.